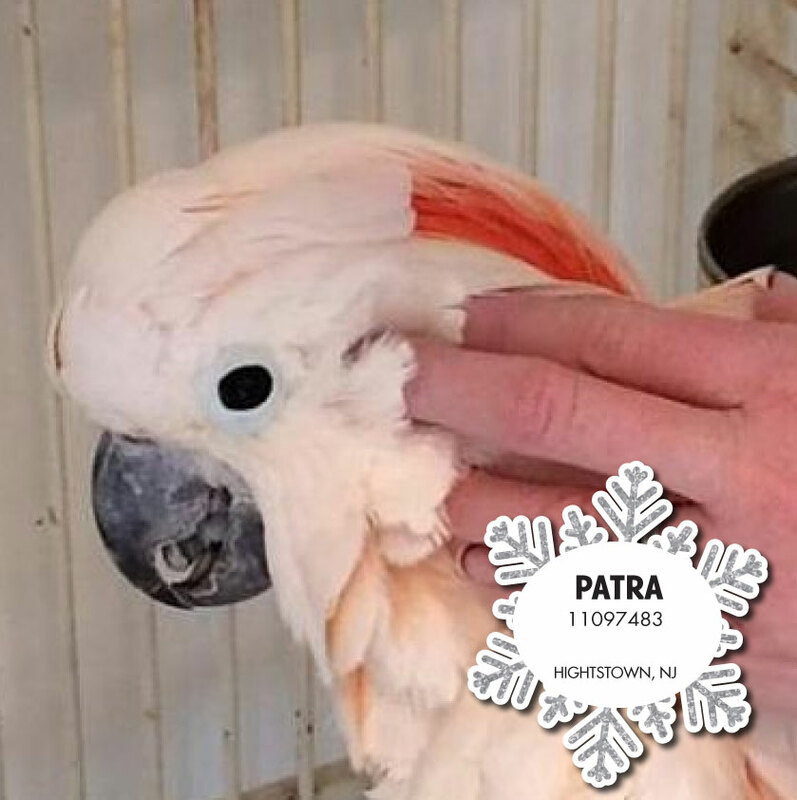 Hightstown, NJ - Patra Fancy meeting you here, darling! Are you the one I’ve been looking for my whole life? Please, call me Patra. I am the absolute most beautiful Moluccan Cockatoo you will ever meet! Birthday Est August 2000. Some things you should know about me, since I believe in being up front and telling you all about myself: I am a diva – in all senses of the word. I love to sing, and I can be loud if I think you are too far and can’t hear me. I LOVE attention, and I would do best in a home where my primary caregiver is home most of the time. I am a total cuddle bug, and I adore all the snuggles and scratches you can give me. What is this fancy-schmancy thing I’m wearing, you ask? I thought you’d never ask! It’s the latest in feather protection jewelry. You see, I love my showers and I love preening – one has to stay beautiful. However, sometimes I get over-zealous in preening and I self-mutilate. That means I cause harm to my skin, in addition to pulling my feathers out. This tends to happen more when I’m feeling needy, but then I don’t look so pretty, then I get upset, and it becomes a vicious cycle. So, it’s just easier for all of us if I wear it except for when it’s bath time. I’ve been called challenging, I’ve been called fussy, but they’re just names. I mean, all this wonderful personality that is Patra doesn’t come without a little bit of effort, and we’re not all perfect. So, if you think we are meant to be, why don’t you look me up sometime soon?